Satisfy the need for secure and accessible bike storage with the Bike Locker 40™ Series. Engineered to meet the requirements of facility demands, offering a high level of security for bike and gear stowage. The superior design of this unit protects bicycles against vandalism and weather elements. The locker maintains its original structural integrity under 40 psf of snow and winds up to 90 mph. With bike ridership becoming more popular, the versatile Dero Bike Locker™ 40 is a popular addition for office buildings, beach areas, winter resorts and more. 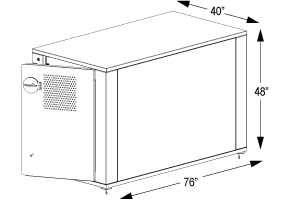 Constructed utilizing commercial grade steel, this locker features an 16-gauge steel door crafted with a ventilation window, 18-gauge steel side and top panels, an optional perforated steel floor and a base supported with steel leveling feet. Optional pads are suggested for asphalt surface installations. 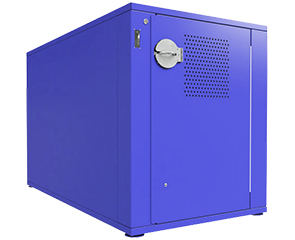 The fully enclosed locker is secured via U-Lock, padlock or keyed lock panel that corresponds with the 4 digit number on the factory installed plate—custom numbering is available.